This swipe and go, no-fuss lipstick delivers the perfect lived-in lip look—no mirror required. Swipe once for a pigment-rich, stained effect or more for a fuller-coverage look. 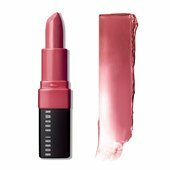 Free from titanium and other ingredients that add weight and give opaque coverage, this formula gives lips color without feeling heavy, for a un-lipstick look and feel. Add two or three more for even more intense color payoff.